FARNBOROUGH, United Kingdom, July 16, 2014 – Boeing [NYSE:BA] and Hainan Airlines today announced that the two companies are finalizing terms and working toward a purchase agreement for 50 737 MAX 8s, reaffirming the Chinese airline’s preference for an all-Boeing single-aisle fleet. FARNBOROUGH, United Kingdom, July 16, 2014 /PRNewswire/ -- Boeing [NYSE:BA] and Hainan Airlines today announced that the two companies are finalizing terms and working toward a purchase agreement for 50 737 MAX 8s, reaffirming the Chinese airline's preference for an all-Boeing single-aisle fleet. The commitment, valued at more than $5.1 billion at current list prices, will be subject to the approval of the Chinese government and will be posted on Boeing's Orders & Deliveries website once all contingencies are cleared. 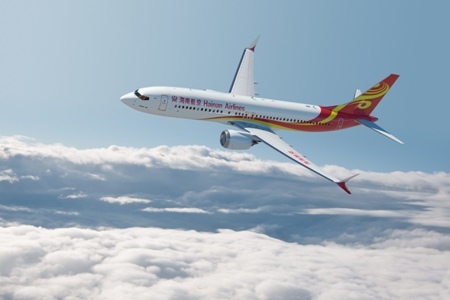 "The 737 is the backbone of our single-aisle fleet," said Adam Tan, vice chairman and president of Hainan Group. "The new 737 MAX will help our airline grow, become more efficient and offer five-star service for our passengers." "It is a privilege to welcome Hainan Airlines as Boeing's newest 737 MAX customer," said John Wojick, senior vice president of Global Sales and Marketing, Boeing Commercial Airplanes. "As China's first Skytrax 5-star airline, Hainan continues to modernize its fleet with market-leading next-generation airplanes, including the 787 Dreamliner and now the 737 MAX. We are confident that the 737 MAX will play a significant role in Hainan's continued success." The 737 MAX has surpassed 2,100 orders from 42 customers worldwide and is the fastest selling airplane in Boeing history. The 737 MAX incorporates the latest-technology CFM International LEAP-1B engines to deliver the highest efficiency, reliability and passenger comfort in the single-aisle market. The 737 MAX 8 provides customers with more flexibility and cost efficiency than the competition in the heart of the single-aisle market. Airlines operating the 737 MAX 8 will see an 8 percent operating cost per seat advantage over the A320neo.